The battle for the hottest IPOs among stock exchanges is fierce, and it looks like the New York Stock Exchange has won first prize. Early in the year, it looked like Nasdaq (NDAQ) would be a shoe-in, after it landed the Facebook (FB) listing. Of course, the Facebook IPO was an epic flop, and the New York Stock Exchange (NYX) ultimately edged ahead of its rival. 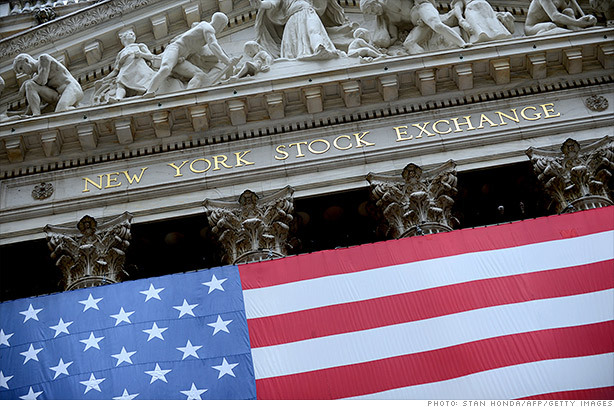 The NYSE landed the majority, or roughly 53%, of all U.S. initial public offerings, according to data from Dealogic. And after missing out on Facebook, the NYSE also landed 52% of all technology IPOs. Corporate spinoffs also helped, with 20 of the 77 companies that listed on NYSE spun out of existing publicly traded companies. That's quite a reversal from 2011, when Nasdaq won 78 IPOs and NYSE claimed just 71 listings for its exchange. Shares of the NYSE's parent have also surged 21% this year, compared with Nasdaq's nearly flat performance. The bulk of the rally came last week, after NYSE Euronext agreed to be acquired by ICE, an exchange that trades commodities and derivatives, for $8.2 billion. Beyond winning listings, the exchanges also try to lure companies away from each other. NYSE nudged out Nasdaq, with 16 companies moving to the NYSE from the Nasdaq, compared with 12 that moved the other way. Overall, 2012 was a relatively slow year for IPOs, with only 145 companies going public. That was one fewer than in 2011, but they raised $47 billion in 2012, compared with $41 billion in 2011. Part of the increase came from Facebook's outsize offering. The IPO market is still a far cry from its recent high point of 2007, when 288 companies filed for IPOs and raised $65 billion. After a tepid 2012, many investors and market participants predict an uptick in 2013. Hotly anticipated IPOs like Twitter and Square should be absent from the lineup, but Bob McCooey, the head of listings for Nasdaq, said he's seen more companies considering an IPO compared to this time last year.